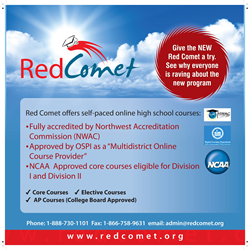 Red Comet, an Accredited, Self-Paced, Online High School, Launches New Advanced Placement Courses. Red Comet introduced several new high school Advanced Placement courses that have already been approved by the College Board. For the 2014-15 school year, students may enroll in several AP courses, including Art History, Calculus, Computer Science A, English Literature & Composition, Human Geography, Macroeconomics, Microeconomics, Psychology, Statistics, and US Government & Politics. These courses allow high school students to explore college-level curricula and allow them the opportunity to potentially earn college credit. By enrolling in Advanced Placement courses, students get an advantage over their peers when they attend college.